Spoon Auger Falls is a 40-foot drop along Spoon Auger Creek near the Chattoga River Bridge on Burrells Ford Road. 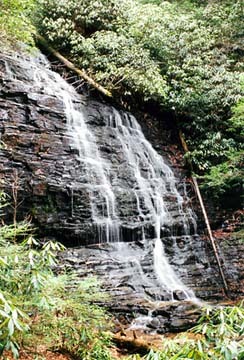 The falls are easily accessible by a short hike, the final portion of which is a steep walk up four switchbacks. The parking area and trailhead are just past the Burrells Ford campground parking area. 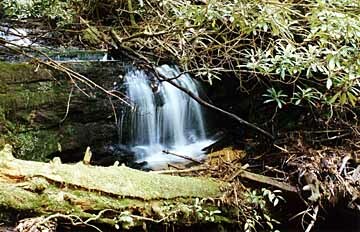 After walking northwest along the Chattooga for a couple hundred yards and crossing two small creeks, look for a sign on the right leading to the falls. Spoon Auger Creek will serenade you with numerous cascades along the hike the switchbacks up to the main falls. Directions: From Walhalla, take SC 107 north for 17 miles to Forest Service road 708 (Burrells Ford Road). Proceed down FS 708 for 2.7 miles. Park in the designated area. If you cross the bridge over the Chattooga, you've gone too far.